Ok I know I am boring you with blue but I just cannot resist. I made another blueish free css template. This time a little lighter blue but it is blue still. This template is 3 column with left menu for your categories, links and whatever else you want. It has center area meant for content and if you look at it there is also a place for the whole 728x90 banner at the top. On the right there is a place for another menu or some skyscraper ad like you can see it on Live Preview. 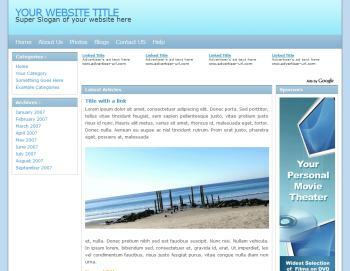 All in all this template is as always usable for any kind of website - blog or simple personal or business website. Hope you like it.